Who doesn’t adore steamed buns at a dim sum restaurant? But did you know they are relatively simple to make? I assumed any authentic recipe would be labor intensive and the buns themselves would be tricky to form and cook properly, so I was thrilled to discover that the dough is incredibly basic and the buns are a cinch to shape. My girlfriend Pinchy had bookmarked the Steamed Pork Buns recipe from the Feb/March 2011 issue of Fine Cooking magazine, which we followed fairly closely (although my edits are shown below). I did make our pork from scratch the day before, but you could very easily use purchased BBQ pork and quite honestly, you could use any leftover cooked pork for this recipe. We also both agreed that this would be equally wonderful with BBQ chicken or extra firm tofu. Go ahead and double the recipe as we did and you will have a dozen buns to eat right away and a dozen more to freeze for a rainy day. Cut the loin lengthwise into two equal pieces. Score each strip crosswise with a paring knife 5 or 6 times on each side. Put pork in a shallow bowl to marinate. Combine oyster sauce, hoisin, dark and regular soy sauces, mirin, and peppercorns and pour over the pork. Marinate for at least 8 hours or up to 24 hours. When you are ready to cook the pork, heat the oven to 450 and position the rack in the top third of the oven. Put the meat on a heavy baking sheet lined with foil. Spoon some of the marinade on the meat. Bake for 30 minutes, basting every 10 minutes with the juice from the pan. Then, turn the broiler on high and place the meat 3-4 inches from the flame so it gets slightly charred in places, about two minutes per side. Let it cool thoroughly and dice into 1/4 inch pieces. 3/4 C. milk, at room temp. 1/3 C. water, at room temp. Mix the dry ingredients in a large bowl and make a well in the center. Slowly pour in the milk and then the water while gently mixing until both are absorbed. Add the lard or oil and mix until a dough forms. 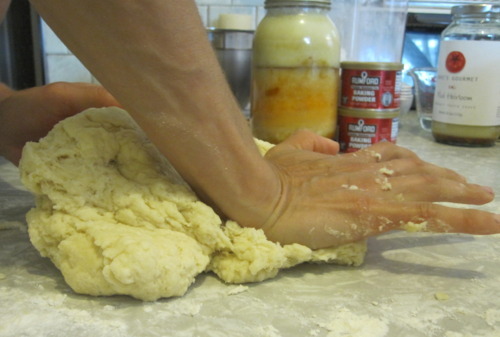 Turn the dough out onto a work surface and knead for 10 minutes, or until the dough is smooth. Return to the bowl and cover with a damp cloth for 1 hour. This is a good time to make your filling. In a medium bowl, whisk together the broth, oyster sauce, ketchup, sugar, cornstarch, and soy sauce. Heat a wok over high heat for 30 seconds. Add the peanut oil and swirl to coat. Add the onion and reduce the heat to medium low and cook, stirring often, until golden brown, about 5 minutes. Add the pork, increase the heat to high, and stir-fry to combine, 2 to 3 minutes. Drizzle the mirin from the edge of the wok into the pork mixture and stir well. Reduce the heat to medium. Make a well in the center of the mixture and pour in the sauce. Stir until the mixture thickens, about 2 minutes. Add the sesame oil and mix well. Pour out onto a sheet pan and refrigerate 15-30 minutes, or until cool enough to handle. Have ready 24 two inch squares of parchment or waxed paper. Lightly flour a work surface. Divide the dough into two equal pieces and roll one of the halves into a 16-inch-long log and cut the log into 12 equal pieces. *Tip: Cut the log in half, then cut each half in half again, and finally cut each quarter into 3 equal pieces – you’ll have twelve! Cover the remaining dough with the damp cloth. Working with one piece at a time, shape a dough ball into a disk that’s about about 4 inches in diameter. The perimeter of the dough should be thinner than the bottom. We found that it was very easy to do press the disk out right on the counter, as the dough wasn’t too sticky. Hold the disk in one hand to form a bowl shape and spoon about 2 Tbsp. of the pork filling into the center. Gather the edges of the dough and pull them up and over the filling, using your thumb to push the filling down as you pleat with your fingers to cover the filling. It may seem like a tight fit at first, but the dough will stretch as you pull it around the filling. Twist the top to seal the bun and pinch off any excess dough. Put the bun, knot side up, on a parchment square and set aside. Repeat until 12 buns have been made, cleaning off your thumb on a damp cloth after making each bun. Divide the buns (still on their parchment squares) equally between 2 layers in a bamboo steamer, spacing the buns at least 2 inches apart. We found that we could place 6 buns on each layer, 5 around the perimeter and 1 in the center. In a wok or large pan, bring 2 inches of water to a boil over high heat. Set the stacked steamers over the boiling water and steam the buns over medium heat until they look fluffy and their tops have opened like flowers to slightly reveal the filling, 15 to 20 minutes. 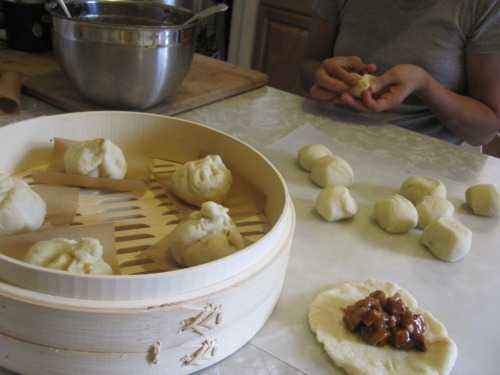 While they steam, prepare the remaining dough as described above, covering the filled buns with a damp towel to prevent them from drying out while they wait their turn to steam. Remove the steamers from the wok and put them on platters to serve the buns immediately, or allow them to cool if you will not be enjoying them right away. Buns will keep in the fridge for 3-4 days or in the freezer for up to 3 months. To reheat, defrost if necessary and steam over medium heat for 5-7 minutes. 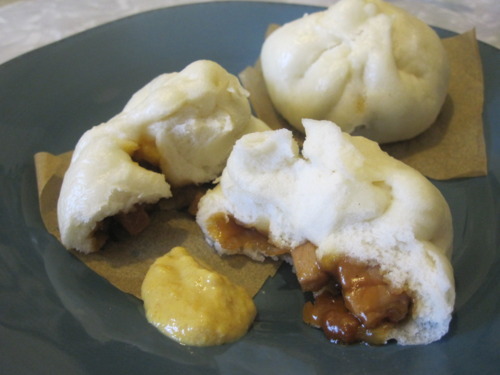 This entry was posted in baking, pork and tagged appetizer, asian, baking, pork, steamed buns. Bookmark the permalink.